Funding further studies is both an expensive venture and a long-term investment. Sadly, while many students have the enthusiasm and drive to be successful in further education, many students lack the necessary funds. Nevertheless, there are a number of education grants that make funding further education easier and make it possible for more students to carry on studying. Like a scholarship, a grant is a non-repayable amount of money that is given to students in order to help them fund their education. However, unlike scholarships, grants are largely rewarded based on financial need as opposed to merit. You will find that grants are geared towards specific groups, such as those from minority backgrounds, students with disabilities, students studying certain subjects, students that fall into a specific age range and those who come from a very low-income background. Grants come in a range of sizes and from a range of organizations, including: employers, colleges, universities and the government (federal, state, and city). Governmental bodies offer a number of helpful grants. The U.S. government is the main source of grants in the U.S. and offers a variety of grants to aspiring students. 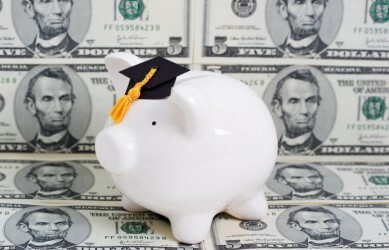 The main grants offered by the U.S. government include: Federal Supplemental Education Opportunity Grant (often abbreviated as FSEOG), the recently added Academic Competitiveness Grant and Pell Grant. However, there are also more specialized grants such as Teacher Education Assistance for College and Higher Education (TEACH), which is awarded to students who wish to become a teacher after completing their degree. To apply for a government grant, you should complete the Free Application for Federal Student Aid (FAFSA). The form will ask you a number of questions regarding your financial background in order assess your eligibility for government aid. The FAFSA can be completed online, over the phone or on paper. The internet is a fantastic resource for finding a grant to fund your future studies. Have a look at government websites, your school website and even your employer’s website as some employers offer education grants to their employees. Be sure to make a note of any eligibility requirements and application deadlines; you don’t want to miss out! It is recommended that you pay your school’s financial aid office a visit. The staff here can not only help you find a government grant, but they can also answer any questions that you have and highlight any school grants or scholarships you may be eligible for.